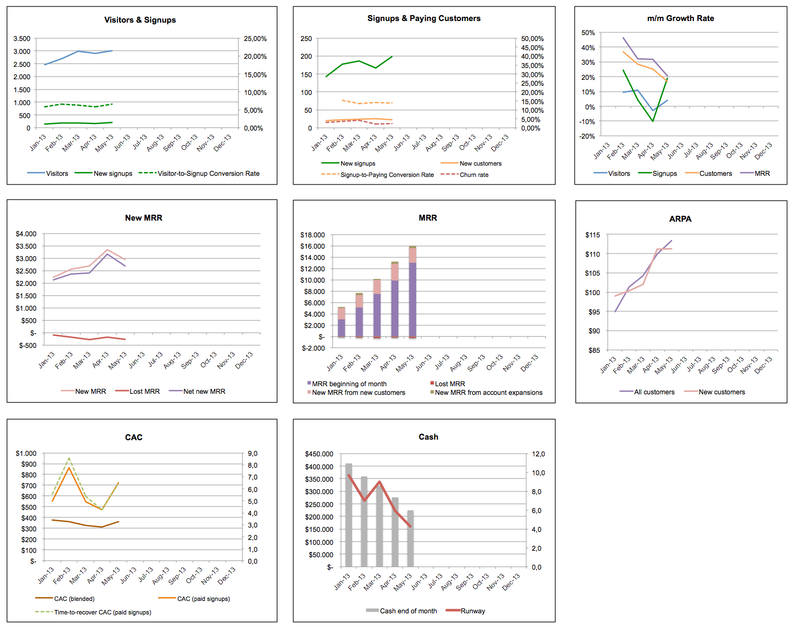 Over the last few years I've helped quite a lot of SaaS startups to create or fine-tune their KPI dashboards. While every situation is a bit different there's also a lot of overlap, which made me think that it would make sense to publish my template (not without polishing it a bit). 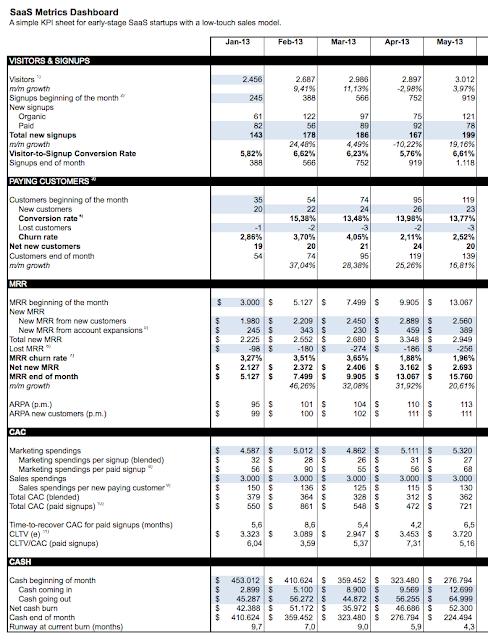 I hope other SaaS startups will find it useful, and it will also make it easier for us to communicate what KPIs we're looking for when we talk to SaaS entrepreneurs. here is the Google Docs version. One comment, though. 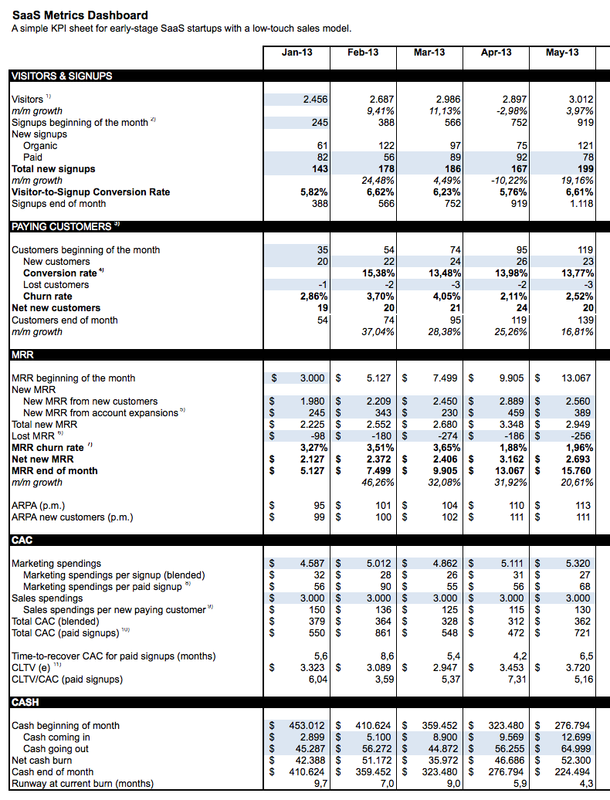 Although I've developed this sheet on my own, I've learned a lot about SaaS metrics from David Skok, who I am very thankful for. David created a SaaS dashboard as well, it's a bit more sophisticated and has a slightly different focus, but it's quite similar. Check it out, and if you have not read his brilliant articles about SaaS yet I highly recommend that you do so. They are an absolute must-read for every SaaS entrepreneur. Like this post? Follow me on Twitter. Great template. I'm curious what you use for marketing spendings early on when a startup is using all free marketing methods (SEO, content marketing, wom, etc.) and self-serve sales. Are you using $0 for marketing spend or do you calculate some cost based on the time spent to do those marketing efforts? Very cool! Thanks for sharing. Great summary table. Just for definition. How do you typically handle cancellations for the MRR calculation? Lets say a client cancels in one month, but his contract still runs until the next month. Would you count that as cancellation in a MRR sense in the first month or only the month later when he really drops out of revenue? Love to have the excel version if you don't mind sharing. Thanks again for the great post. Thanks Chris, that's a fantastic template. You've included every important metric. This is stellar, thanks a lot! What tools do you use to track these metrics? I had built my own model of this and its totally crap compared to this sheet! Thanks Chris! Thanks Chris, this is great. Agree about David Skok's blog too - great resource. How so? Should it be $0 because no actual dollars are spent or should it be $100/hr since you're spending time on it? Well, just make sure you're not double counting? If a salaried person is doing the work, then it's not additional money. I think I recognised most of the acronyms, but is there a glossary for all of the terms like MRR, CAC, CLTV etc? Thank you for your comment, and sorry about the late reply, Wade. Good question. I think I would not calculate marketing/sales costs based on the time spent by the founders or early employees but rather view this as part of the fixed costs and consider the customers "organic". If you put them into the "paid" bucket and calculate the CAC based on the founders' time etc I think the result will be misleading in the sense that you won't be able to scale customer acquisition at those CAC because what you're doing is harvesting the lowest-hanging fruits. Thanks Alexander! I'd do it based on the time when he drops out of revenue. Fantastic one. Thanks for sharing this. Started using this for the past 2 weeks for all updates and has been very useful to track updates. looks like a great dashboard & would love an Excel copy if the offer still stands! Dropping you an email now & bookmarking your blog! Finally had time to grab this spreadsheet and apply our business to it. One question - how do you apply usage based revenue outside of MRR? Meaning, if a customer pays us $10 per month for the platform and $10 for text messages they've sent through it in a given month, should I (1) assume we should only count $10 of that as MRR and (2) if so, do I put the other $10 anywhere in the model? Thanks for your question, Jeff! I would say the answer depends on the level of fluctuation of the usage-based revenue. If you get around $10 in usage-related revenues from the customer every month, I would include it in MRR. If it goes up and down strongly, I think it would be better to add a "non-recurring revenue" line to the model. Superb! We are just getting started with Brightpod.com and this is going to help. I wonder if you can automate most of this if you are using a tool like Kissmetrics. 1. Should we take "Unique Visitors" or "Visitors"? 2. Would you count traffic to the blog? I am thinking no but just asking. 3. Traffic is purely organic at this stage so I am putting $0 for the CAC section. ok? Just ran across this. Looks great. Would love a copy of the spreadsheet if still available....thank you. Big help - thanks Christoph. Thanks a lot for sharing your dashboard! I've just started using it recently and I'm very happy! * How would you incorporate different distribution channels? We're in the process of integrating with PaaS providers and those accounts are not coming from visits to our website so it would be good practice to keep track of them separately. It's a whole different funnel: they visit the site on the marketplace, convert to free, convert to paid, everything happens within our partner. I think it would make sense to have separate funnels and stats for each type of channel, but do you have any suggestions? * How would you incorporate different plans? We have different plans (dedicated servers) and are about to add others (shared). In addition, a single user may be running multiple plans (servers, actually). The prices and availability are even different depending if the customer is coming from a channel (revenue share) or is a direct customer. Thanks again for sharing this and looking forward to your feedback! We have a mix of monthly, quarterly and annual payment customers. For entering MRR would you suggest that we enter the full Payment received in the month it has been received or break it into equal parts through the entire enrollment period. Would it impact the model? Any thoughts on initial setup fees as well which may be as high as 2 quarters payments. I represent a SaaS based HR software EmpXtrack. Tushar, you need to break it into equal parts through the subscription period. As it happens I've just revised the spreadsheet to support annual plans. Will publish it soon. If you want it already, please email me at christoph@pointninecap.com. Setup fees should be recorded separately from MRR as non-recurring revenue. It doesn't have to be a bad business just because the revenue is transaction-based. eBay is a fantastic transaction-based business, just to give you one example. Your revenues may not be "recurring" strictly speaking but you can still have repeat customers, predictable revenues and high CLTV. I absolutely agree, I was just wondering since I rarely ever read any advice about it or any KPI typically used for it. Do you have any pointers? Not at the top of my head. Will keep it in mind in one of the next revisions of the spreadsheet! That would be really great and very useful! Thanks for considering it. Christoph, for mobile first companies that have traffic coming directly from app downloads, how would you add that into this dashboard? Eg. would it be blended into the website visitors? Or it's own section? And if so, how will it impact the rest of the metrics? Do you have some example from companies you've invested in? I truely excited to read your article also I read watch you dummies,you done a quietly Great work , I really appriciate of this work.Get Cutomized theme and dynamic dashboard check it. This is a great dashboard, Christoph! Curious though...how do you work in Annual plans into it? Good question. :) I've meanwhile created an updated version that includes annual plans. +1 for the clarification here. There's no right or wrong here, it depends on how you're looking at it, i.e. what you want to know, and you of course shouldn't double count expenses. What exactly would you like to get clarified, Tim? Oops! Should have been clearer myself. +1 to support Matt's point on not double counting. Was referring to Matt's comment as the clarification itself :).